DJkit are excited to present Numark’s Mixtrack Pro 3, the perfect digital controller for the skilled, aspiring DJ looking to outplay the common mixer. The Numark Mixtrack Pro 3 offers a vast array of pro-level features: all at a cheap introductory price. Building on former models, The Numark Mixtrack Pro 3 retains the same basic programme with the authentic 2-deck layout and touch-activated platters. However the Pro III also includes many fresh features included to make your mixes sound more professional. Such exciting features include the class-exclusive 100mm pitch sliders, specially designed to help you execute professional sounding fine pitch adjustments without any drift. You can also use the Mixtrack’s new multi-function touch strip feature for dynamic FX control and Strip Search operation. These innovative adaptations are a simple and perfect solution designed for those new DJs aspiring to juggle beats at a higher level. Although the Pro 3 showcases many pioneering components it also covers the basics. If you don’t yet have a DJ software platform, no problem! The Numark Mixtrack Pro 3 also comes with the standard Sereto DJ Intro software, which is simple to set up and use: if you ever find yourself ready to move on to the full Sereto DJ software, the Numark Mixtrack Pro 3 comes upgrade ready! And if that’s not enough, Numark has fitted the Mixtrack Pro 3 with both ¼ and 1/8-headphone connections and dedicated filter knobs for each channel, ensuring that you have every base covered. On top of all the Mixtrack’s brilliant programming, the model itself is well made and of good quality. The metal jog wheels are high resolution and Numark have included dual 5-inch hyper-responsive platters. The panel is light and it as solid as a rock, so you can take it any and everywhere without fear of a clumsy hand destroying your kit. The Numark’s Mixtrack Pro 3 is a fantastic solution for all budding DJs looking for extraordinary quality, easy transportability and unbeatable value. Considering purchasing the Numark Mixtrack Pro 3? Have questions? Ask people who've recently bought one. Do you own the Numark Mixtrack Pro 3? Why not write a review based on your experience with it. Feels well built and works perfectly with VDJ! This is a great controller. The build in sound card is great, the controls are very responsive and this is generally a great controller. Only just starting back in to the game after about 22 years out and boy has the game changed. Purchased the MixTrack Pro 3 just to see how I get on and to be honest it's I live it. Ever so smooth and simple to use, easy set up and light weight to carry around. Serato intro software that it runs is also simple to use with some great features, once I've had longer playing with it I may move up to the full Serato software but the intro is perfect at the moment. Good solid construction and easy to use. Would be nice to be able to change the gain for each side and I'm not sure about the sliding touch screen bit... For the price though I'm happy. Getting so much more than you paid for! I was a vinyl DJ back in the day, and after painstakingly converting all my old vinyl to digital (plus a few years of downloads) I wanted something to have a mix with after a hard days graft - hence my "entry level" purchase. But this is a lot of kit for your money! Bought it with the Serato upgrade (a must if you don't already have the full version) and got straight back in to it. The controls have a quality feel to them, pitch sliders are very responsive and the jog wheels are super smooth - using them instead of the pitch bend buttons is as close as you'll get to that vinyl feel. The only criticism is that it doesn't have much oomph, but for home mixing, the Numark Mixtrack Pro III is perfect. Very fast delivery and great communication from, DJKIT! An all round good beginning controller, with many features that can be found on higher priced controllers. Highly recommend this to anyone thinking of getting into the hobby. Not a dramatic improvement from Mixtrack Pro. The jog wheels are metal and solid which is good. But the buttons still feel a bit cheap and the touchpad is not particularly good. I use Traktor and if you buy it now (June 2015), the Numark Pro setting in Traktor doesn't work, hence you have no choice but to use Serato intro or upgrade to Serato dj. Or you can map it yourself. I can do some basic mapping but not enough to map it all to traktor so it was pretty useless to me and I had to return it. If you want an affordable controller and you use Serato, then it's fine. But If you use Traktor, wait until there's a good mapping for traktor. Otherwise I recommend investing another £150 and get something better; which is what I'm doing. Great from Numark, cheap, well made and a great bit of kit. 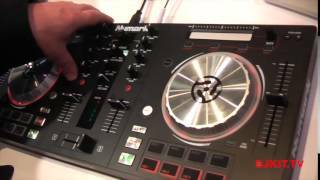 Seen a video for Numark Mixtrack Pro 3 online or have you own video? Check out Numark Mixtrack Pro 3 on DJkit.com!